Vinobraní literally translated means Grape Harvest Dance. 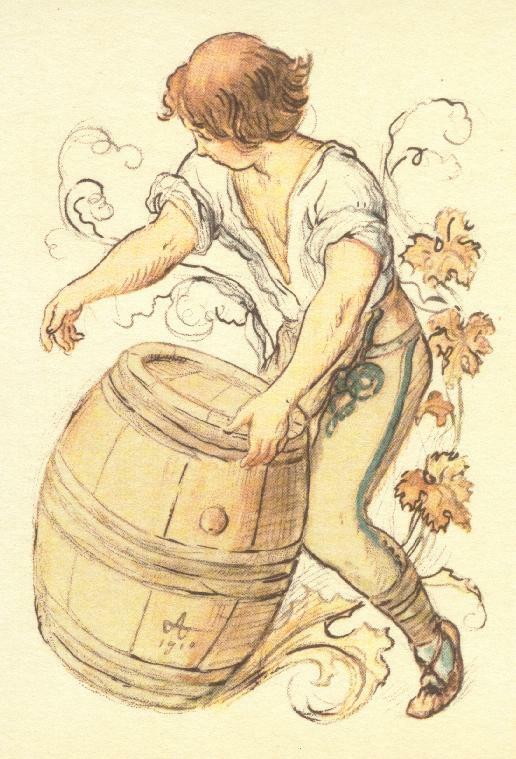 Bohemia's rich soil and mild climate were well suited for the cultivation of grapes. Local wine industries developed. Near the end of the growing season the farmers would contract with the vintner to sell their grapes. After an agreement was concluded, the grapes became the property of the winemaker (even though the grapes were still on the vine). Soon it became mischievous sport for the former owners of the grapes to sneak out into the fields and remove portions of the crop from the vine. The new owners of the grapes had to keep watch over their investment. To do this they employed constables to police the vineyards. The townspeople did everything they could to outwit the policemen and escaped with bunches of grapes. Every year this routine was repeated and before long it became a tradition. VINOBRANÍ is a reenactment of this event. The grapes and apples you will see in the Hall "will become the property of the winemaker." The policemen will begin patrol of the property. Everyone at the dance are encouraged to join in the sport of stealing the fruit. Some will be successful while others will be arrested by one of the policemen and taken to the judge for sentencing. All will enjoy the judge's decision. Take exit (34). Route 7 (Philadelphia Rd.) north off Baltimore Beltway I-695. Turn left onto Hospital Drive. Turn right onto Lennings Lane. The hall will be on your left. Send your comments and other feedback to our Webmaster.